Insurance call centers fielding incoming claims need to familiarize themselves with common red flags that indicate fraud. While a call may seem ordinary at first glance, inconsistencies can tell another story. If an insurance representative thinks the claim may be dishonest, he or she can perform some rudimentary background checks. For example, did the customer finance the car? If the customer is upside down on the loan or recently lost his or her job, there is an incentive to get rid of the car. Hit-and-run accidents. Several incidents of hit-and-run claims are legitimate. The insured can describe the vehicle that hit him or her, and they may even have a partial license plate number. At the very least, they can provide clear details about what happened. However, when an insured customer calls in to report a hit-and-run, but he or she is shaky on the details, the claim warrants further investigating. Recent or incongruous coverage. Collision insurance is standard for every insured customer. Many choose to include comprehensive as well. However, if an insured has only had collision coverage for the previous decade and suddenly adds on comprehensive, this should trigger a red flag for any claim that follows on its heels. For example, if an insured customer discovers a tree fell on his or her car, the collision would not cover the damage. However, if the damage isn’t severe enough to prohibit driving the vehicle or if the insured can wait it out, they may take out a comprehensive policy to use after the fact. Other times, insured customers will take out policies with way too much coverage for the condition of the car. Any claim that occurs in this situation should also prompt further investigation. Unusual communication methods. If a client refuses to receive documents by mail, this can be an indicator that the claim is false. The client may not live at the location listed on their policy, hence wanting all documents handled electronically or in person. Insured customers who are hard to get ahold of by phone can also be an indication of fraud as email correspondence allows them time to get their story straight whereas phone calls require them to remember details on the spot. Repeat offender. Insured individuals who are in similar accidents on a regular basis may require another look. For example, if a customer files hit-and-run claims several times a year, they may be false. There are always plausible explanations, such as if the customer has street parking on a busy road, but it’s worth further exploration all the same. Charred remains. 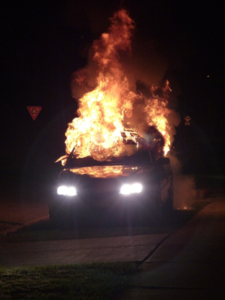 Many would-be arsonists are under the false impression that burning a car to the ground gets rid of all the evidence. However, today’s forensics and investigators can usually identify the accelerant. If any of the above elements apply (i.e. the vehicle is over-insured, the customer can’t afford the car payments due to life circumstances, etc. ), that is all the more reason to investigate a burned car. Another factor to consider is the location. If the vehicle is in an empty area far from any other structures, this can indicate the fire was set on purpose. Insured customers have several reasons for filing fraudulent claims. With vigilance and keen observation, claims adjusters can pinpoint common signs of a false claim. However, no human is perfect. If an insurance company wants to keep fraudulent claims to a minimum, they will need to put a quality system in place. Contact Actec to learn more about our full cycle claim and incident reporting solution today.